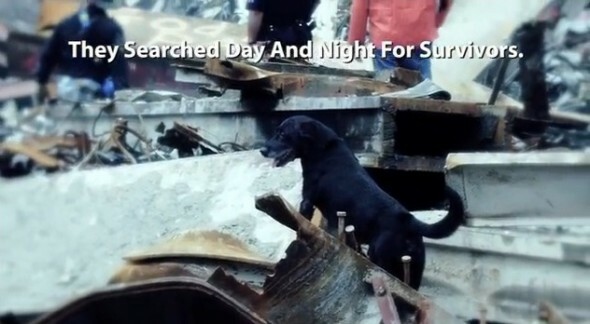 Over 300 specially trained search and rescue dogs scoured the debris in the days following the WTC collapse. They searched for survivors, and when there were no more to be found, they moved on to find remains. 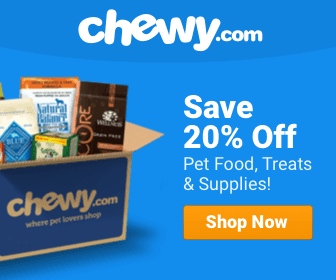 As the nation memorializes one of the worst events in our recent history, we take time to honor some canine hero who helped survivors of the tragedy. On the morning of September 11, 2001, Genelle Guzman-McMillan was working in her office in one of the World Trade Center Buildings. She heard the terrible noise outside, and as she fled down the stairs, the building crumbled around her. It would be 27 hours before she was pulled from the wreckage – the final living person to have been saved. It wasn’t a firefighter or police officer that found her, but a dog. Genelle Guzman-McMillan (blue dress) pictured with her husband, Roger, and daughters Kimberly, Kaydi and Kellie at their home in Long Island, N.Y., on Aug. 7, 2011. Photo by Dan Callister. Her story was one of many that inspired documentary producer Tanya Kelen to showcase some of the canine heroes of that day. Also honored were the first responders, trainers and veterinarians who helped make the dogs’ dedication possible. The program aired yesterday on Animal Planet, but unfortunately, there are no additional airings for the next two weeks (according to TV Guide). Guzman-McMillan was one in a team of about fifteen Port Authority workers all trying to evacuate the building at once. Guzman-McMillan was trapped by steel and cement, unable to move until a dog alerted rescuers to her location. She was the only one in her group to survive. She was told by doctors that she would never be able to walk again. She defied them by becoming able to run again. She has since gotten married and had two daughters. 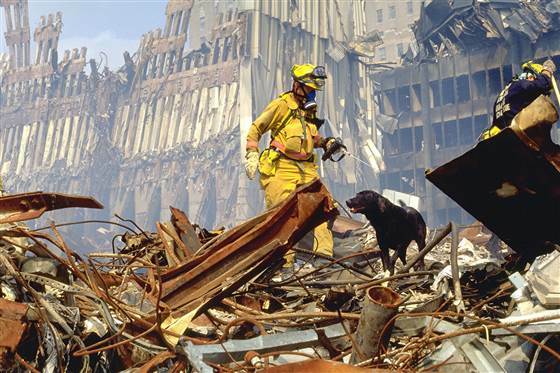 Over 300 specially trained search and rescue dogs scoured the debris in the days following the WTC collapse. They searched for survivors, and when there were no more to be found, they moved on to find remains. They also located jewelry and other personal items of victims that could be returned to mourning loved ones. Others served as therapy dogs to help victims and loved ones cope with the traumas they endured. 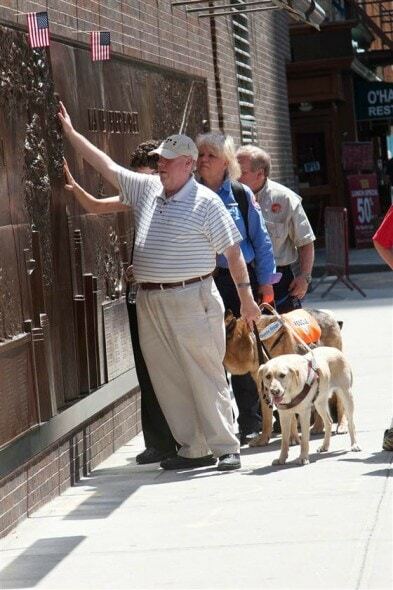 Another saved on 9/11 was Michael Hingson, whose seeing-eye dog Roselle led the WTC employee out of the building. Though people aren’t supposed to pet guide dogs while they’re on duty, a firefighter passing by Hingson stopped to pet and cuddle Roselle. Michael Hingson visiting a 9/11 memorial wall 10 years after the event. Photo by Animal Planet. “It was probably the last unconditional act of love he got,” he said of the fireman, who died later that day. Hingson later penned a book called Thunder Dog: The True Story of a Blind Man, His Guide Dog, and the Triumph of Trust at Ground Zero. Together they traveled the world, and Roselle died at the ripe old age of 13. Veterinarian Cynthia Otto. Photo by Animal Planet. 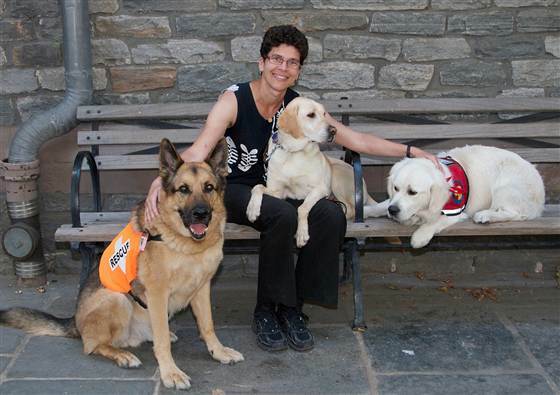 Kelen also featured stories of people like veterinarian Cynthia Otto. She was head of healthcare for the search and rescue dogs, some of whom were injured by smoke and debris. Many of these dogs had been rescued from shelters and trained for their special jobs. I watched the Animal Channel Program about the rescue dogs on 9/11. I could not help but shed tears. The dogs had to be made to take breaks for water, food and IV’s.. I later watched the program on the soldiers and dogs who work together in Afghanistan. Many a soldier’s life has been saved by these wonderful animals. One of the dogs was killed by a grenade. Immediately when he was hit the paramedics took himto the Mash Unit and Docs and nurses worked on him until the vet arrived. Sadly the dog died from his wounds. His handler held it together until the dog was covered with an American Flag and loaded on the evac chopper home. I cried with the soldier. Dogs re quite amazing when it comes to loyalty to the people they love. Another soldier who was wounded was sent back to his base in Alaska. His dog suffered PTS and had to be discharged from duty. He was given to his handler who was wounded and they were reunited in Alaska. More tears. Every person lost in 9/11, every soldier who has and is fighting along with these animals who protect, defend and rescue are heroes.